These are not the usual tips such as aliquoting primers, using designated areas (three room rule) and equipment for the pre- and post-amplification steps to reduce the risk of contaminations. So let’s get into it! It might not always be feasible but if possible choose amplicons with higher GC contents. The average extension rate for guanine (G) and cytosine (C) was found to be 2.8-fold higher than for adenine (A) and thymine (T) at temperatures up to 75°C. The optimal GC content is around 60%. Here, the highest extension rates were observed between 70°C and 75°C (at temperatures below 70°C and above 75°C, the extension rates showed almost linear decrease). For templates with a low GC content or GC content bigger than 60%, extension rates decrease. Here, high GC content has more impact than low GC content, probably due to the formation of secondary structures in the region of extension. It is, however, crucial to test different GC contents for the polymerase that is used. Native and a deletion variant of Taq polymerase showed increased extension rates with increasing GC content (up to around 80%), whereas a Pfu polymerase variant showed decreased extension rates with increasing GC content at 75°C (Montgomery et al., 2014). Overall it is worth checking if higher GC content of the amplicon could reduce the extension time of each cycle. When it comes to speed, the utilisation of dUTP as substitute for dTTP in the master mix should be avoided. Incorporation of uracil (U) is on average 50% slower than of T at temperatures of up to 65°C. The increase of the U concentration in the master mix had no positive effect on the incorporation rate; it even reduced it (Montgomery et al., 2014). Also, the pH of the reaction greatly influences extension rates. However, the ideal range is narrow and between pH 8.5 and pH 8.7. Below pH 8.5, extension rates decrease significantly: around 60% with each pH unit. Above the ideal pH range, extension rates decrease even more significantly and are almost completely inhibited at pH 7 (Montgomery et al., 2013). Other highly impactful factors on the extension rate are magnesium chloride (MgCl2) and potassium chloride (KCL) concentrations. High MgCl2 concentrations of 3 to 6 mM lead to higher extension rates. Specifically, a 1.5 mM MgCl2 concentration has been found to result in an approximately 50 % reduction of the extension rate compared to a con-centration of 5 mM. High concentrations of KCl, however, strongly inhibit polymerase activity. More than 70 % decrease in extension rate has been observed at a KCl concentration of 37.5 mM compared to 0 mM. The greatest polymerase activity has been found when KCl is absent or at lowest concentration (Montgomery et al., 2013; Montgomery and Wittwer, 2014). When the GC content of the amplicon is higher, addition of DMSO at 5% or 7.5% can improve amplification by reducing secondary structures. However, the use of 10% DMSO has been found to decrease extension rates (Montgomery et al.,2014; Montgomery and Wittwer, 2014)! Therefore, it is essential for qPCR speed to adjust pH, and MgCl2 and KCl concentrations of the master mix. Another point to consider is choosing the appropriate dye concentration for qPCR reactions. Noncovalent dyes reduce extension rates and a lower concentration of these dyes has been shown to speed up extension. However, lower dye concentrations result in lower signal strengths and can only be used if the sensitivity of the optical sensor of the qPCR cycler is great enough (Montgomery and Wittwer, 2014). So, the proof of the pudding is in the eating. The run time of a qPCR greatly depends on ramp rates, which is the time that the cycler needs to change between temperatures. A reduction of the temperature differences could have quite an impact! It has been shown that successful PCR results can be generated with fairly broad time conditions and range of temperatures. Bustin (2017) tested six different qPCR cycling conditions for six randomly selected genes in a breast cancer cell line (MCF-7) on two different qPCR cyclers. Denaturation time and temperatures, as well as annealing/extension time and temperature were varied (Table 1) quite broadly and (surprisingly) generated approximately the same number of quantification cycles (Cqs), also called threshold cycle (Ct). Table 1: Different qPCR reaction conditions for assays that were carried out in parallel on two different qPCR cyclers. Melt curve analysis indicated that the same amplicons were produced at all different conditions, except for Ubiquitin C on one of the cyclers. In conclusion, this showed that good qPCR results can be obtained with lower denaturation temperatures and shorter denaturation and annealing/extension times! The time to perform a 40 cycle run with adjusted conditions as described only took around 60% of the time of a run with standard conditions (Bustin, 2017). Eurofins Genomics' reliable and tried and tested PCR primer design tools are based on “Prime+” of the GCG Wisconsin Package that was originally written by Irv Edelman enhanced with additional parameters for perfect PCR primer and probe design. In selecting appropriate PCR primer/probe combinations for genotyping and gene expression assays, a variety of constraints on the PCR primer, probe and amplified product are considered and partly predefined as default values in our qPCR assay design. For the bi-plex qPCR assay design, all primers and probes are again cross-checked against each other. The results are scored according to the best predicted performance criteria. For your convenience you can directly order the selected PCR primer pairs or PCR primer/probe combinations in our shop. Eurofins Genomics high quality NightXpress (q)PCR Primers will increase the completion of your qPCR project. Order today and they will be delivered in less than 24 hours! So, you can almost immediately begin your qPCR-based investigation. (q)PCR Primer NightXpress is suitable for every kind of standard and real-time PCR. We guarantee accurate and reliable primer quantities with high purity. Also, the low salt concentration of these primers gives stable melting temperatures (Tm). 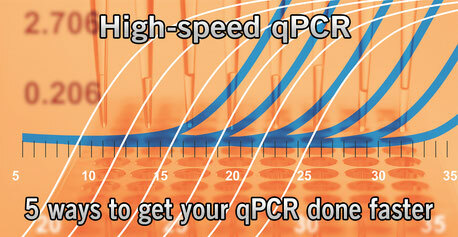 Get your NightXpress (q)PCR Primers here. The Minimum Information for Publication of Quantitative Real-Time PCR Experiments (MIQE) guidelines provide methods for the design of qPCR experiments to guarantee consistency in publishing data. Abiding by these guidelines will aid the generation of reliable qPCR data that are comparable and reproducible (consistency between experiments) (Bustin et al., 2009). It will also contribute to getting your data published. - Bustin, S.A. (2017) How to speed up the polymerase chain reaction. Biomol Detect Quantif. 12: 10-4. - Bustin, S.A., Benes, V., Garson, J.A., Hellemans, J., Huggett, J., Kubista, M., Mueller, R., Nolan, T., Pfaffl, M.W., Shipley, G.L., Vandesompele, J., Wittwer, C.T. (2009) The MIQE guidelines: Minimum information for publication of quantitative real-time PCR experiments. Clin. Chem. 55(4): 611–22. - Montgomery, J.L., Wittwer, C.T. (2014) Influence of PCR reagents on DNA polymerase extension rates measured on real-time PCR instruments. Clin Chem.